It is hard to build a life around the missing pieces of the heart. 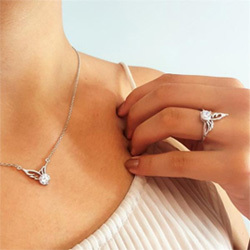 This lovely angel wing heart necklace will be a constant reminder of the unsevered bond you share with your loved one. In it, you will find comfort in knowing that someone so special will never be forgotten. The saying on the sterling silver angel heart pendant reads: »A piece of my heart has wings«. I put mine on the day that I received it and haven’t took it off . I purchased three one for myself, one for my sister and one for my Cousin who my mom always said was her 3rd daughter. My Mom passed away November. Helps me deal with the loss!! I love the necklace it describes how I feel about my granddaughter. Absolutely love this necklace...purchased two ...one for myself and one for my sister...in remembrance of our mother...thank you so much...it’s beautiful!! Bought for my daughter who became a widow in February. Hope she likes it. I am very satisfied. Love all 4 I got they are for my sisters for Easter to remind us of our mom who died. Love this necklace. It is beautiful. Only thing I would change is size of clasp. It is hard to get on by yourself. A little larger clasp and it’s perfect. I wish there was an offering to engrave the back with a names. I loved my necklace! I will keep buying thinks from your company! I received mine today. I love it. So glad I ordered it. Absolutely love this piece...I get so many compliments on it whenever I wear it. Perfect gift for anyone that has lost a loved one! They are beautiful. Ordered them for my sissy who lost here daughter to heart failure. She absolutely loves them. Gave this to my friend on the anniversary of her son's death. She loved it. I bought these in remembrance of my mother for my sisters and I also bought one of these and remembering for my girlfriend's mother and they all love them. I gave it to my daughter to remind her of her that passed awhile ago but this one spoke to me and was perfect for her. I bought this for my daughter who recently lost her husband .. She loves it and has had many compliements on it . Bought for a friend who lost her son to cancer.She loves it! My sister bought this for me as a birthday gift, as I lost my son 4 1/2 years ago. I like the fact that it can be fastened to hang at any length. It's very special, and I will treasure it always! The necklace is beautiful. I bought it as a gift for my sister and she hasn't seen it yet but I know she will love it as I do. Thank you. Everyone I meet says its beautiful. Everyone I've given them too so far loves them ! Lovely, substantial pendant on chain, good quality, feels just right ! I lost my son 3 years ago to a motorcycle accident. This piece is perfect for me to always hold his memory near and dear to my heart. It brings me comfort. This necklace is a beautiful reminder for someone who has past for a very dear friend, who lost her daughter.And I know for certain that this will mean something very special too my dear friend. I purchased this item for my girlfriend along with another necklace, one for her and one for her daughter, she loved them both so now I will be purchasing one for her daughter. I actually haven't seen it yet as I had it delivered to my cousin who lost her mother. She is thrilled and says it's beautiful. I ordered this for my daughter for her wedding day! She’s going to attach it to the ribbon on her bouquet in memory or her great-grandma! It was a perfect gift and a reminder to her that grandma is always with her! My daughter and I both love the necklace. Its so pretty and cant wait to show it off. Very beautiful I really like it my husband would think it is beautiful too. I love the necklace I bought. It's very detailed and beautiful . It is beautiful just wish It was here to answer the other questions. Happy with my necklace, just a little hard to read the inscription. It is truly beautiful. It is for a very dear friend of mine and I know that she will love it. The perfect gift! I was very satisfied that I kept receiving e-mails informing me of the status of where my necklace was in the shipping and final receipt of the product. Felt that was very important to a customer paying online as opposed to buying something in a jewelry store. Overall, very happy with my purchase! Thank you!